Winter is a past winner of the National Spelling Bee, a stellar student, fledgling writer, and a early admit at Kenyon College for next year. She's always been a good girl and done what was expected of her. But then, a careless post on social media of a joke that falls flat goes viral. Suddenly, people she does not even know are attacking her online, calling her a racist or worse. And the outcry is followed by far worse repercussions: her title is stripped away, her acceptance to Kenyon is revoked, and her mother's career is jeopardized. Winter's attempts to apologize simply inflame mass opinion and make things worse. Her plans and future destroyed from that single post, Winter embarks on a search to understand who she is, how she can move on, and what sort of future she can have. A surprising and thought-provoking look at cyber-shaming, microaggression, and so many other interesting topics, this is a book begging for a book club discussion (if you've read it and have an opinion, I'd love to hear from you!). And while the ending may be a bit naively optimistic, Sales has so many interesting things to say that I won't begrudge her attempt to "solve" some of the issue. I loved the sheer complexity of the characters, who defy easy classification. Winter's evolving relationship with her African-American BFF Jason is particularly interesting and worthy of an essay on its own. 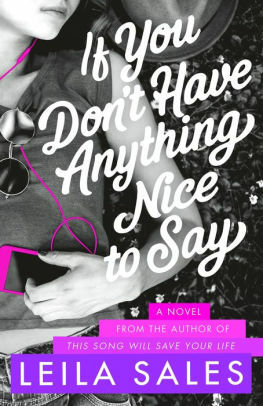 The book's nod towards romance was also well done and complex, raising its own issues about prejudice. The adults do get short shrift, but Sales knows that her readers won't mind keeping the attention on the kids. I do wonder if events have overtaken this story. Winter's own particular "crime" seems so trivial compared with the daily barrage of offenses trumpeted on the internet these days. It's hard to imagine anyone would even care what she had said, if she said it today. And that, in itself, would make a fabulous discussion topic.